Before leaving on vacation this week, I traveled to the Durham County Detention Center (the city jail; sometimes referred to with sarcasm as the “downtown Hilton”) with Pastor Edgardo to visit and pray with one of my Latino parishioners. Even though I had a lot of things to do before heading to the beach – clothes to pack, errands to run, and a honey-do list the length of the my arm – I was glad that I was able to take a little time before leaving to spend in prayer with a brother in need. Visitation of the sick and the imprisoned is not only a calling and command from Jesus, it is also a means of grace. This is not a new insight for me (I got it from John Wesley), but it continues to slap me upside the head every time I “make time” to travel to prison or jail. I don’t take God with me. God is there long before I arrive and long after I depart to my other daily tasks. In truth, God is there waiting for me and others like me; waiting for us to drop by and say Hi – waiting for us to care – waiting for us pray with, cry with, and sing with those who are behind bars – waiting for us to remember those who are in prison as if we were there in prison with them. Repetition in worship, Bible study, and small group gatherings is a good thing. Some of us need to remember that the next time we sing the same old songs over and over again, repeating that Creed or prayer or refrain for the umpteenth time. It is a good thing because these responses, prayers, songs, and creeds become a part of our spiritual rhythm. My friend in prison testified to as much while we were with him. His case is dragging out, his family is on the outside struggling to make ends meet, his future is uncertain, his pod (a two-story cell block) is basically on lock-down for almost 20 hours a day due to overcrowding issues … in my mind, he had every right to be angry, depressed, frustrated, and self-loathing as are many of his pod mates. Instead, this brother was responding to bad news from his lawyer with “Gozo, gozo, gozo” and ” Dios es nuestro amparo, nuestra fortaleza, nuestro pronto auxilio en la tribulacion.” (two praise songs from weekly Bible study). As Edgardo and I left the building that morning, I turned to him and said “I hope you heard that as an affirmation of your ministry. Years and years of weekly Spanish Bible studies that you have led … driving the van, picking folks up, singing Spanish coritos over and over again. That is what is supposed to happen. As Christians, when trials come our way, we respond not with %&#*&$#@! but with the the Doxology, or the Lord’s Prayer, or a Psalm, or a song.” Repetition can be a good thing. Going to jail or prison on a regular basis is something I need to get back to. Many of you may not know this, but throughout my pastoral ministry, I have always been a volunteer prison or jail chaplain – both in Creswell and in Durham. I blame it on John Wesley. It all began day at my first appointment in the country. I had passed the little medium security prison on Hwy 64 about 10 times since I had moved to the area a few months prior. The eleventh time, my car pulled into the parking lot of its own accord. The shotgun-toting guard in the tower was a little concerned that a private vehicle was coming on the premises when visiting hours were clearly over. After shouting back and forth to the tower guard with something insightful like “can I speak to someone in charge?” … I was led into the administrative offices to offer my services to the chaplain of the facility. Anthony Hathoway, the prison superintendent and a deeply committed Christian, told me there currently was no chaplain. An hour and a half later, after some conversation, coffee, and fellowship – I left his office as the new chaplain for the Washington County Detention Center, a 150 bed State Prison facility. Three and a half years later, I would make a similar trip in my new appointment in Durham to the city jail. I went looking for the chaplain. I left as the new chaplain. All this is to say that for the past 13 years of my ministry, I have tried to visit those in prison at least once a week. I can’t tell you how many times God blessed me and sustained me through brothers and sisters behind bars (subject of a future post). Unfortunately, the past year or so my schedule eclipsed this means of grace from my life and I am determined to put it back in place this year – at least on a monthly basis. My little children, I am writing these things to you so that you may not sin. But if anyone does sin, we have an advocate with the Father, Jesus Christ the righteous; 2and he is the atoning sacrifice for our sins, and not for ours only but also for the sins of the whole world. The Spanish says it slightly differently, and the word “abogado” jumped out at me. Abogado – not just “advocate” but the word we had been using all morning in our discussion – “lawyer.” God is our lawyer. God is our judge. God is our advocate. Suddenly I John took on a meaning to the three of us that I, for one, might have missed if I had not heard the passage read in Spanish. 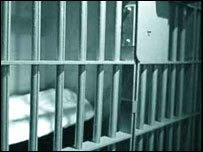 For those who are in prison, God is not only with them when they are locked back behind cinder block and cold metal doors – God is also stating their case before the Judge and dispensing justice, forgiveness, and mercy from the elevated chair at the front of the court room of history.